A few months ago I had the wonderful situation of getting payed for a game coloration job. And since I needed a new light table (Ikea table didn't work that good if you need to clean up a lot of sketches...) I bought one. 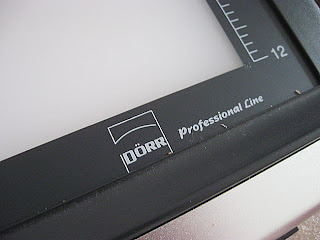 My light table is from the "Dörr Professional Line", measures around 30 x 46 centimeters and is awesome. It's one of those flat versions and I like the whole thing a lot. 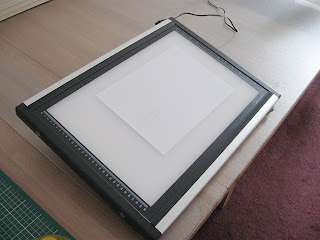 If you need to work with bigger paper sizes a light table with 46 cm length is quite nice, not to mention that it doesn't weigh tons. I got mine from ebay which didn't hurt that much. What I like as well is that the cable is quite long. If you happen to have a lack of outlets this is very practical (I happen to have a very big lack of outlets). 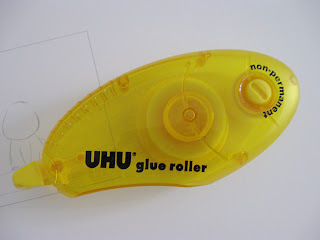 Best friend for lightboxes and two sheets of paper: Uhu Glue Roller (non permanent!). I roll some centimeters on the copy paper and stick it to the final sheet... copy... and rub it off. Works good although i should mention that you shouldn't keep it too long on a sheet or else it gets yucky when you rub it off and smears. 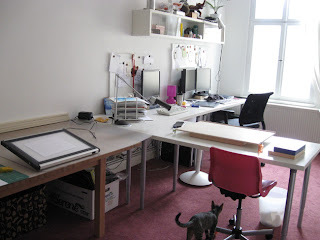 And because Lew was so nice and offered help for flattig comics (yes, .. comics!) Ty and me spend the last evening to set up her working space next to mine. How's life? - Oh, nice!